From Newport to New Delhi, a tremendous effort is currently underway to document and analyze China’s pursuit of maritime power. Led by experts in think tanks and academia, this enterprise has produced a rich body of scholarship in a very short period of time. However, even at its very best, this research is incomplete—for it rests on a gross ignorance of Chinese activities at sea. For its part, Japan systematically issues data on Chinese presence in the waters adjacent to the Senkaku Islands. Graphical depictions of these data vividly show Chinese expansion over time, from the inaugural intrusion of two CMS vessels in December 2008 to the regular patrols that started in September 2012 and continue today. Indeed, the quality and consistency of this data has enabled foreign analysts to use quantitative methods to test theories about shifts in Chinese diplomacy. 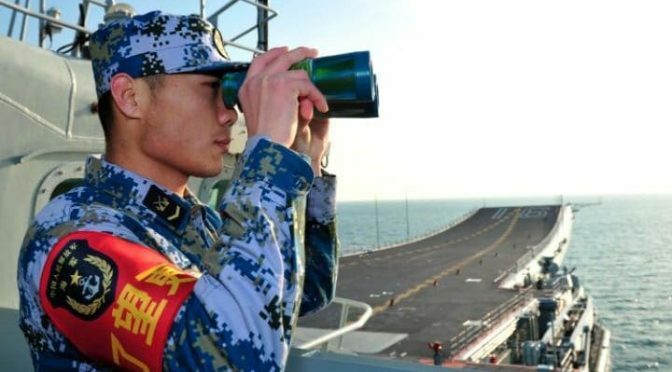 Naturally, U.S. naval intelligence professionals, particularly those in the Pacific, pay close attention to the comings and goings of Chinese maritime forces. To this end, they employ a wide variety of sources, from highly sensitive national technical means to visual sightings made by U.S. and allied forces at sea. They also optimize other resources of the U.S. intelligence community to support their mission requirements.4 Suffice it to say, the naval intelligence community is well aware of the disposition of China’s naval, coast guard, and militia forces. The foundation of this effort is the Pacific Fleet Intelligence Federation (PFIF), established in September 2013 by then United States Pacific Fleet Commander, Admiral Cecil Haney. The PFIF “provides direction for the organization and collaboration of the Pacific Fleet’s intelligence and cryptologic resources to support the maritime Operational Intelligence (OPINTEL) mission” of “tracking adversary ships, submarines and aircraft at sea.” It represents a level of focus and systematization not seen since the Cold War. The PFIF is a true collaborative enterprise, involving “coordination from Sailors across multiple organizations at various echelons, afloat and ashore, working in unison 24 hours a day, seven days a week providing the most precise maritime OPINTEL to our afloat forces.”5 Efforts are “federated” across nodes in Japan, Hawaii, San Diego, and Washington D.C.6 Relevant data collected by regional allies are also included. The result is the adversary Common Operational Picture (RED COP). Through RED COP, the PFIF provides Fleet Commanders and deployed forces precise geo-coordinate level intelligence regarding the location of maritime platforms across the Pacific Fleet area of responsibility. It also contains a detailed pedigree of the sources used to identify the location of an adversary unit. 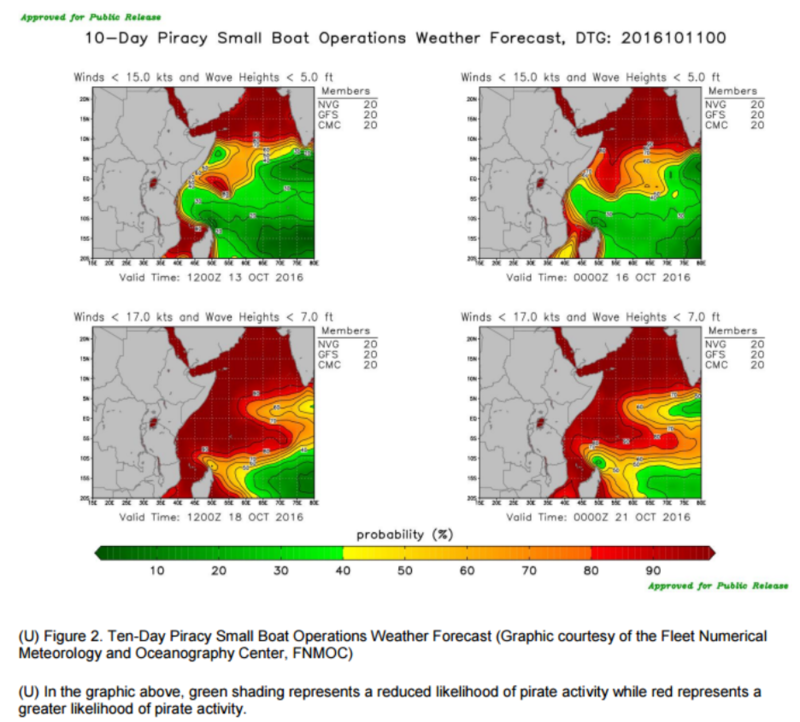 10 Day Piracy small boat operations weather forecast from Office of Naval Intelligence (U) HORN OF AFRICA/GULF OF GUINEA/SOUTHEAST ASIA: Piracy Analysis and Warning Weekly (PAWW) Report for 6 – 12 October 2016. Releasing such data would immediately benefit efforts to understand Chinese maritime strategy. It would open up whole new swaths of scholarship. Chinese actions could be directly correlated to Chinese words. Incidents could be placed in their correct context. Theories about China’s pursuit and use of sea power could be proposed and tested with new levels of rigor. Better open source analysis would also benefit the intelligence community itself. The strengths of academic scholarship—such as understanding strategic and organizational culture—could be applied to the same questions that preoccupy USN analysts, perhaps yielding fresh insights. 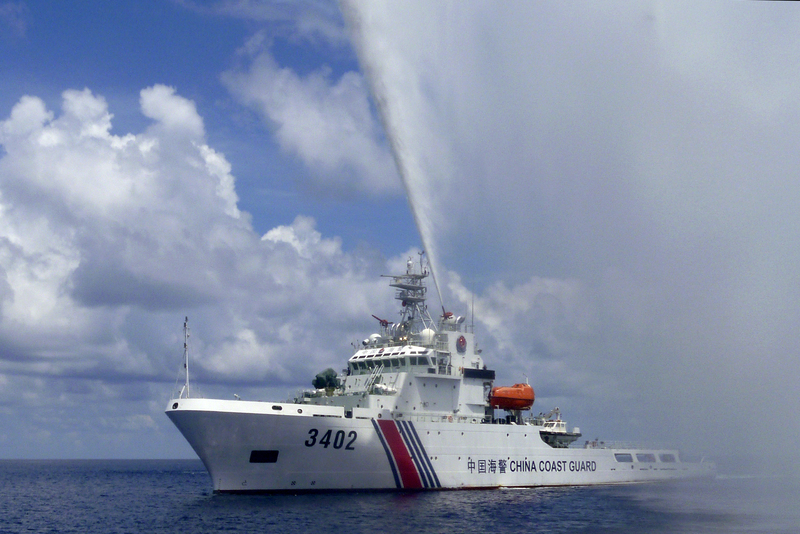 Efforts to contextualize the activities of China’s maritime militia, for example, would be especially welcome, given its peculiar social, cultural, and political roots. While scholarship is valuable in and of itself, the ultimate purpose of such an initiative would be to improve the ability of our democracy to respond to the China challenge. Elected officials, who ultimately decide policy, take cues from public discourse. 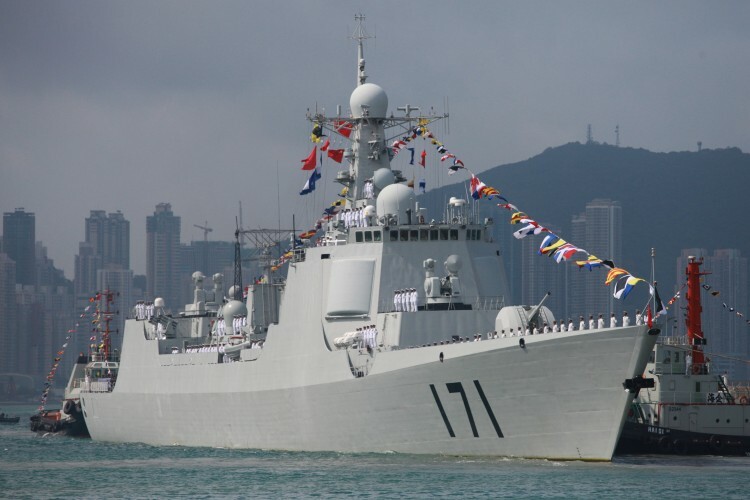 Thus, if wise policies are to be crafted, the broader American public must be fully aware of the threat that China’s pursuit of maritime power poses to American interests. This is especially important given that any proper response would require the whole nation to bear costs and accept risks. Unlike Russia, China’s actions are carefully calibrated not to arouse a somnolent American public. This places a very high premium on information about the actions that China is taking. To be sure, information is not an antibiotic. Ingesting it in the right quantities at the right frequencies may not cure the disease. Indeed, there is already enough data in the public domain for Americans to see the key trends. Yet there remain some very smart people who cannot, or will not, recognize the perils we face. Even so, the correct antidote to intellectual biases is ever more information; as data accumulates, the naysayers must either alter their theories or risk self-marginalization. Sharing facts about Chinese activities at sea is not just good for democracy, it is also smart diplomacy. At this point, merely shining the spotlight on Chinese maritime expansion is unlikely to persuade China to radically alter its strategy. The China of Xi Jinping is less moved by international criticism than the China of Hu Jintao or Jiang Zemin. 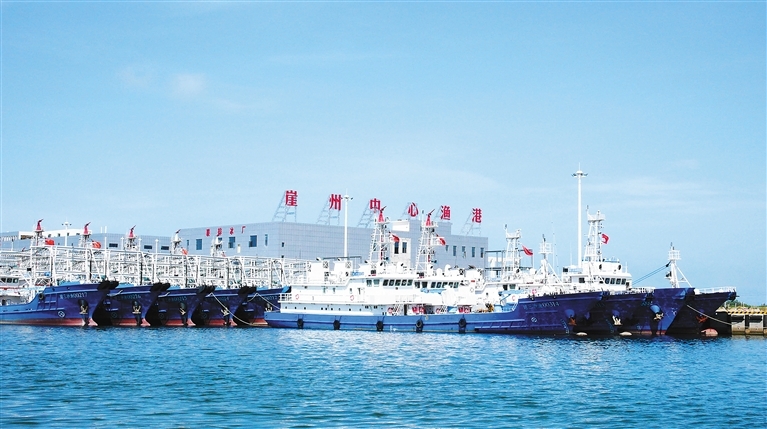 However, releasing detailed data on Chinese activities at sea would likely have an impact on foreign publics, who will use it to draw more realistic conclusions about the implications of China’s rise. Moreover, making such information widely available would help counter spurious Chinese narratives of American actions as the root cause of instability in the Western Pacific. Both outcomes are in our national interest. To adopt the approach advocated in this essay would require a political decision. On matters of national policy, naval intelligence professionals must yield to civilian leaders.7 In the end, then, this essay is for the politicians. And so is its last word: share with the scholars. James E. Fanell is a retired U.S. Navy Captain whose last assignment was the Director of Intelligence and Information Operations for the U.S. Pacific Fleet and is currently a Fellow at the Geneva Centre for Security Policy. Ryan D. Martinson is a researcher in the China Maritime Studies Institute at the U.S. Naval War College. The views expressed are those of the author and do not reflect the official policy or position of the U.S. Navy, Department of Defense or the U.S. Government. 1. 张元农, 周卓群, 李克一 [Zhang Yuannong, Zhou Zhuoqun, and Li Keyi] 潜航深海磨利刃 [“Sailing Submerged in the Deep Ocean to Sharpen Our Blade”] 人民海军 [People’s Navy], 8 October 2014, p. 3. 2. 顾曹华 [Gu Caohua] 动中抓建，铸造深蓝铁拳 [“Seize on Construction While in Action, Mold a Blue Water Iron Fist”] 人民海军 [People’s Navy] 8 January 2014, p. 3. 4. James E. Fanell, Remarks at USNI/AFCEA conference panel: “Chinese Navy: Operational Challenge or Potential Partner?”, San Diego, CA, 31 January 2013. 5. James E. Fanell, “The Birth of the Pacific Fleet Intelligence Federation”, Naval Intelligence Professionals Quarterly, October 2013. 6. Ibid. James E. Fanell, “The Birth of the Pacific Fleet Intelligence Federation”, Naval Intelligence Professionals Quarterly, October 2013.